You may be aware of the Clinic for Special Children in Strasburg, Pennsylvania, which treats children suffering from rare genetic illnesses, primarily within the Amish and Mennonite populations. The clinic was founded by Dr. Holmes Morton, a West Virginia native, in 1989. Each year the Lancaster community puts on an auction to benefit the clinic, which operates with much support from the Plain contingent. Certain highly rare diseases can be found in Amish and Mennonite communities and these are the ones the Clinic specializes in treating. The field of genomics has created numerous moral and ethical questions, but Morton and his partners show the life-affirming work that can be done using knowledge of the gene. A recent story at nature.com opens with the plight of the Hoover family, whose children have suffered from the genetic malady SCID, a blanket term for a range of disorders attacking the immune system. Though the Hoovers’ son Raylon died because of the illness, their newborn daughter Kendra was saved by swift treatment facilitated by the clinic. The photos of the Hoover family on this page were taken by Bill Coleman. Bill’s son Noah kindly shared on their connection: “Bill and Dr. Morton have known each other for years and Bill dedicated his last book to Dr. Morton’s clinic. Dr. Morton specifically requested that Bill do the shoot (very nice of him). 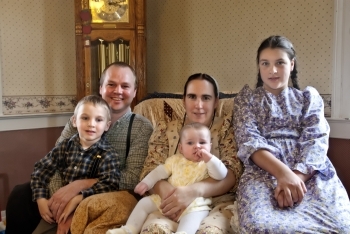 We just met the Hoovers, who are a Mennonite family, last month.” These images emanate a joy which I’m sure this family must be feeling that Kendra is still with them. You can read more about the Hoovers and the clinic at this article at nature.com. For me the field of genomics has always raised moral challenges. As a Catholic I’ll admit I’m not at all comfortable with the idea that genetic data could be used in prenatal screening that might lead to an abortion decision, for example. There are other issues such as workplace discrimination based on genetic predispositions or the ethical problems over “designer babies”. Genomics demonstrates the difficult questions that can arise as scientific possibilities expand with the furthering of human knowledge. However the treatment work that Morton and others do seems simply a great good for suffering families. I wonder if this clinic treats anyone other than amish/mennonites. I have a friend whose 22 yr. old daughter is fighting a myriad of problems related to her immune system. They nearly lost her last week-end. Do you know the answer to this, Erik? This girl does have the best of doctors in SC and has been to Duke Medical Center in NC. Her conditions are so rare, it’s been a struggle. In my trip to PA last fall I took the Witness farm tour and we passed the road that led to this clinic, as our tour guide talked just a little bit about it. Yes, Dr. Morton and his team do treat other patients besides Amish and Mennonite. However, I’m not sure if they treat adults. As Elizabeth mentioned, your friends should contact the clinic directly. They are tremendously helpful to many. 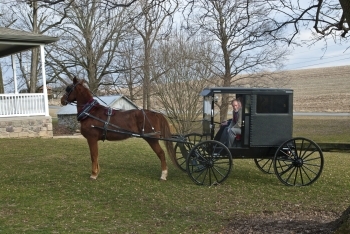 Yes to other than Amish and Mennonite, they are treated, but you need to understand that this facility is geared to the unique Amish/Mennonite issues, and there may be little available for the little one you are concerned for. SCID is only one of the conditions. MSS is another. MSS is a silent killer, only now being understood. Think of sudden onset diabetes, with no insulins having effect. Dr. Morton has obviously been a blessing to the Amish and Mennonites. I don’t know how many of them have problems like these but the work his clinic is doing is creating so much knowledge about the problems and ways to treat them whenever possible. Loretta, perhaps you friend’s doctor(s) could contact Dr. Morton detailing the girl’s specific problems. If there are comparative problems at Morton’s clinic an exchange of information could be great for both parties. Dr. Strauss (see linked article at nature.com) related the Hoover’s story real time at the auction last September – the clinic’s staff was searching for the bone marrow donor that very weekend. Good to hear the outcome was positive. The 2 auctions I have attended have featured speeches by Drs. Morton and Strauss each time. They are quite inspiring. It is something to see the frenzied auction and eating come to a sudden halt as thousands of people stop what they are doing to gather to hear the doctors talk. The community clearly holds the doctors and staff of the clinic in high esteem… and rightfully so. After Dr. Strauss spoke of the Hoovers, Dr. Morton talked about the ways the Clinic uses some of its budget for academic research. He mentioned a young university student who had come to the clinic a dozen or more years ago with some exciting ideas about research he wanted to work on. That research led to the treatment used today in treating GA1. That student was Dr. Strauss. Very interesting. Do Amish couples ever seek out genetic counselling prior to marriage? There is a similar clinic near Middlefield Ohio. (Geauga Co. Ohio, 4th largest Amish settlement) This one has not been in exsistance as long as the Pa. one but is doing similar work.